I was so excited when my friend told me they opened this new store Despaña around Chinatown, for all things from España (hence the name De= from, España= Spain). A small but well stocked specialty store with an array of cure meats, olive oils, balsamic vinegars, canned seafoods and a back counter serving pintxo (small slice of bread with different toppings of cured meats and chorizo), tortillas (made with eggs, potatoe, onions and a variety of other ingredients). I’ve been looking for Ibérico Ham or Pata Negra(the pigs have black feet) for a while now. The first time I had it was at Boqueria Tapas Bar back in January. And let me tell ya, at $25 for a mere 4-5 small slices, this cured meat was way above the rest. So much flavor, I couldn’t stop thinking about it ever since, I was in love. These black Iberian pigs are free range, call the forrest their playground, and follow a strict diet. The highest quality is called Jamón Ibérico de Bellota (these are fed with acorns and cured for 36 months). The next level is Jamón Ibérico de Recebo (fed with a mixture of acorns and grains and cured for 24 months). 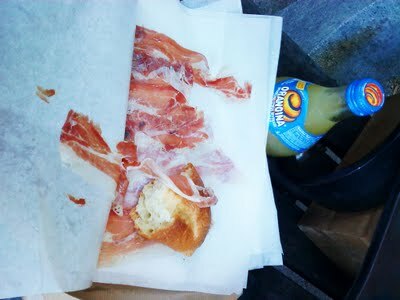 This past Saturday, I made it to Despaña and delightfully found both types of hams. Since this was my first time there, I choose to go with the finest, Jamón Ibérico de Bellota at $159 per LB this was my long awaited treat, 1/4 for $41.34 (it was so well worth it, my only mistake was forgetting to ask for hand cut, the texture is much better than the paper thing machine cut i got, mental note for next time). After getting the ham and other goodies, we power walked to Mulberry and Grand, corner Italian place, got a sesame baguette for $3 and an Orangina $2, then headed a couple blocks down to the park and had the most amazing mid afternoon/dinner sandwich ever. My friend said it was the best darn cured meat he ever had, I say he was darn lucky i shared with him. Sure there’s more fat content than jamón serrano, but fat is flavor! and this rich taste can’t be compared. It’s salty with a hint of sweetness, and nutty tasting, you can almost taste where they’ve been and what they’ve been fed. The fat and meat is such a perfect balance and so flavorful that the taste lingers in your mouth for a while, it’s just so incredible, Ohhhh sooo good. Who needs a box of heart shaped chocolates for Valentine’s Day? I’d take a pound of this cured marbled goodness any day! Make that for any holiday/special occasion. 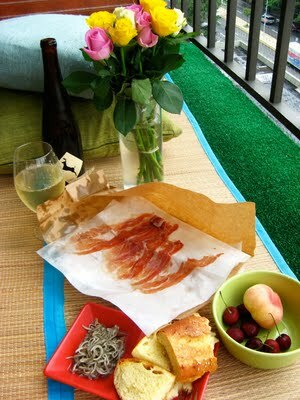 Sunday I made myself a little picnic on my balcony, with a nice local Riesling from Long Island, the rest of the Jamón Ibérico de Bellota with bread (not that we couldn’t finish the 1/4 lb, I could of devoured it all myself, but I wanted it to last another day), plus something else i picked up at the store, a tin of Angulas de Surimi (Surimi Baby Eel in olive oil). 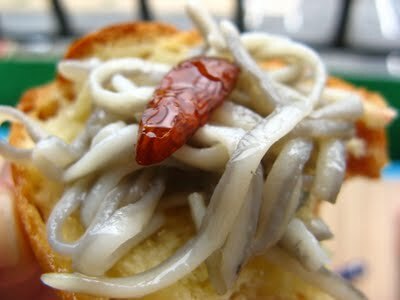 I know they have fresh baby eels in Spain, which are highly priced for its rarity, a couple ounces can cost well over $100. So this was the closest I had. 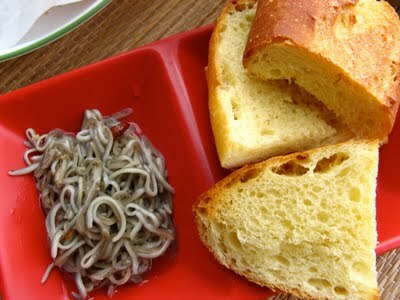 They are actually substitute for baby eels, these are actually made from fish. They come in the tin, swimming in olive oil, garlic and chilli. Super easy to prepare, simply heat them in a pan for a couple minutes and your tapas dish is ready to eat. It’s very tender, mild and delicate, with a little bit of fishyness, and you can slightly tastes the ocean. I really enjoyed it and would buy it again next time. It went very well on top of my toasted baguette and some white wine. Yummmyyyy what a delicious Sunday afternoon. Wow, that price is breathtaking, but I guess you can't put a price on heaven. 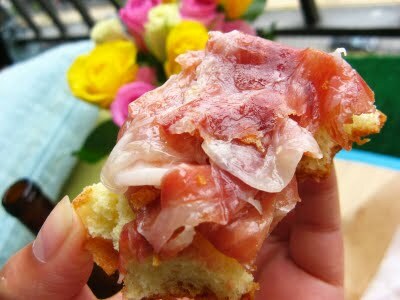 It's been less than 2 years that you could even get jamon Iberico in the States, so enjoy it! I was trying to email you, but the email address on your profile isn't working. Can you email me real quick? Great post! I Love Despana and go frequently. Regarding the fat in jamon iberico. You may have heard that diet animals eat affects the amount of omega 3 fatty acids in the fat. Jamon iberico is packed with the stuff. So the fat in jamon is good fat, like salmon! Enjoy it! Have you been to Pata Negra? They have the most amazing jamon iberico and its about the same price as Despana and you can sit down and enjoy it! Its a few doors down from Motorino. that's great to hear! =))) thanks for letting me know! Thanks for becoming a follower of my blog. Thanks to it I've been able to get to know your blog. It's excellent! And I see you like spanish ham so much. Your lunch at the balcony looks great. I'll be checking you blog, it has so many interesting stuff. Hello, I admire your website. This is a informative site and I wanted to post a note to let you know, good job!